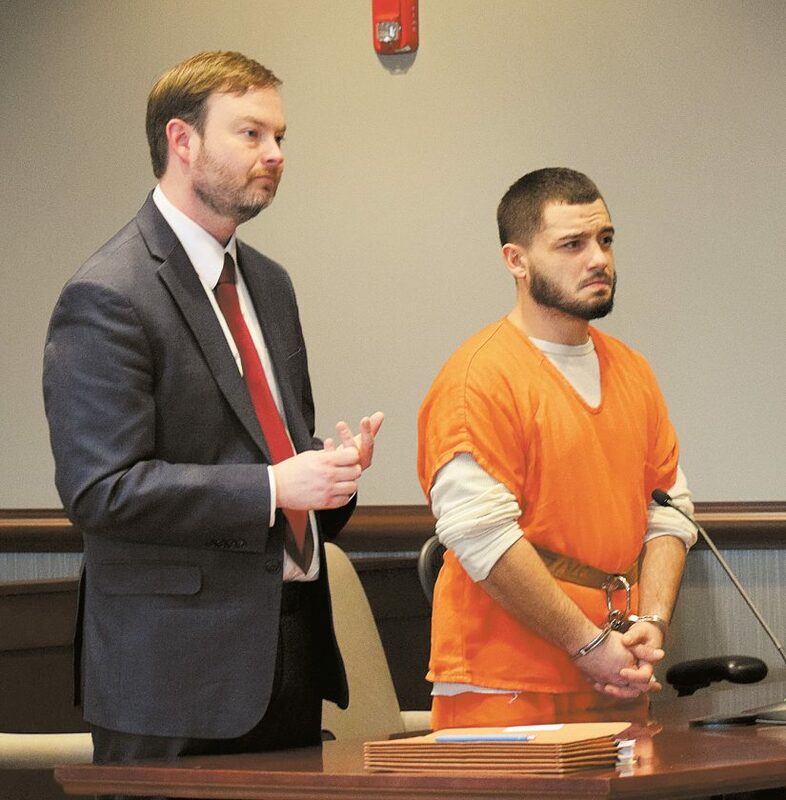 PHOTO BY JILL GOSCHE Joshua S. Chavez (right) stands next to his attorney, Alex Smith, during a hearing in Seneca County Common Pleas Court Judge Michael Kelbley’s courtroom Friday afternoon. A Fostoria man found guilty in January of assaulting a neighbor was sentenced to nearly six years in prison Friday afternoon. Joshua S. Chavez, 26, had been charged with felonious assault, a second-degree felony, after an incident at Hopewell Estates, 8702 W. SR 18, Feb. 3, 2018. The jury had returned its guilty verdict in Seneca County Common Pleas Court Judge Michael Kelbley’s courtroom after about half an hour of deliberations. In February 2017, Chavez had been placed on community control after he pleaded guilty to charges of possession of heroin and possession of cocaine, fifth-degree felonies. Chavez admitted Friday afternoon that he violated his community control. Kelbley sentenced Chavez to 22 months in prison for the community control violation and four years in prison for the felonious assault conviction. Chavez was granted credit for time served. Rebeka Beresh, assistant Seneca County prosecutor, had said Russell Poole was severely beaten for asking if Chavez had taken his money. He had “extensive physical injuries” and went to Mercy Health – Tiffin Hospital, she said. Poole had said he was taken by ambulance to Mercy Health – St. Vincent Medical Center and was released the following morning. Before sentencing, Chavez apologized to the victim, his family and the court. He said he now knows he could have made better decisions in how he approached the situation and was trying to protect his family.